Turn your old car into a tax deductible donation to Susan G. Komen Los Angeles County. Generally the value you will receive for your donation will meet or exceed what you’re given for the trade-in. It’s easy! Just contact our partner, Komen Cars, at 1-855-566-3622 and they will be happy to help you with your car donation. Or, if you would like to fill out an online donation form to donate your car, click here. Donations are tax deductible and donors will receive an end-of-year tax deduction. 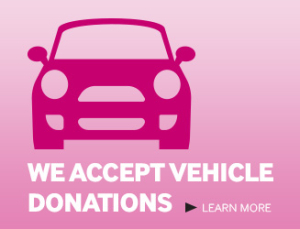 To donate or learn more, call 1-855-566-3622 or visit www.komen-cars.org and a representative will explain the details including tax benefits and speedy pick-up service. We accept cars in any condition. Susan G Komen LA County has partnered and entered into an agreement with Komen-cars.org, operated by the Melwood Charity Car Donation Center, a non-profit organization, to manage and operate their car donation program. Melwood, since 1963 provides job training and employment to over 2,000 individuals with disabilities.